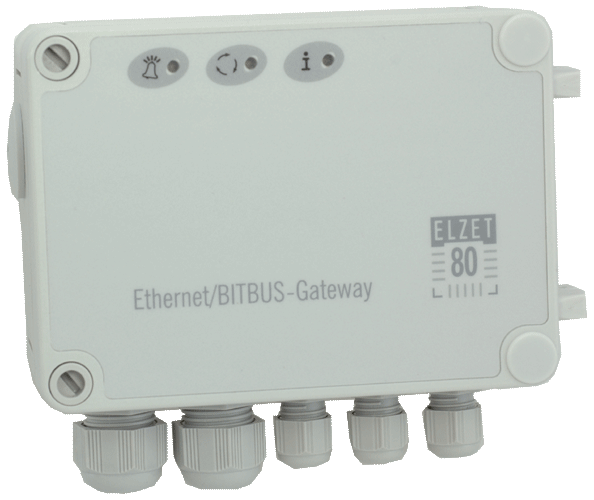 ELZET80's Ethernet-to BITBUS gateways are available as IP65 ruggedized surface box, in two rail mount versions and in a 19 inch rack version. All can work as masters or slaves. When working as a master, the TCP/IP BAPI server listens on port 8044 for BITBUS messages encapsulated in a simple TCP/IP message following BEUG recommendation BAPI/TCP, unwraps them and passes them to the BITBUS. Answers are sent back in the same TCP/IP wrapped form. Up to 16 different applications can simultaneously connect to one ETH-BITx, even from different machines. They are differentiated by their automatically assigned source task field. 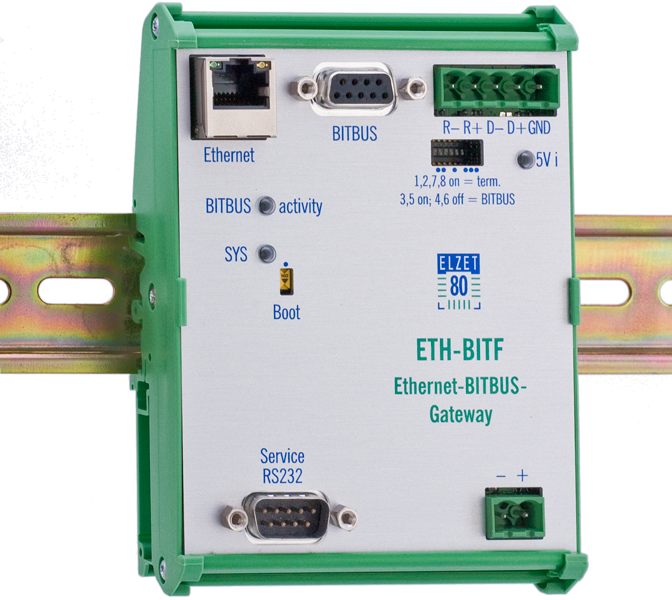 Moving from BITBUS-add-on cards to Ethernet is transparent to your application: The BAPI-DLL for Windows® that ships with ETH-BIT is compatible to our DLLs for the PC add-on-boards IPC-BITxxx and the USB-BIT USB-Gateway. Wall mount box with Ethernet, BITBUS and one RS232 port. Local 24V DC supply required (apply to internal spring clamp terminals). Includes BAPI server software and remote BAPI-DLLs for all modern Windows® operating systems. As above, but with isolated "Power-over-Ethernet" supply (IEEE802.3af) through the Ethernet cable. Provides 200mA* at 24V for external devices. 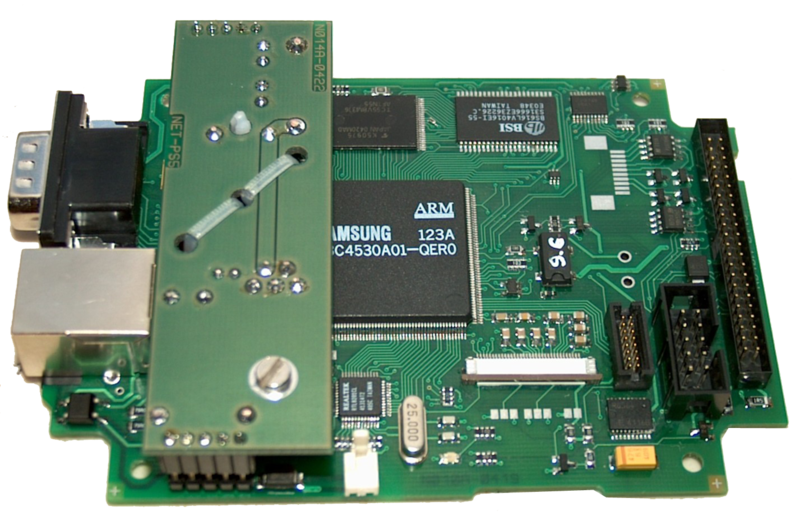 OEM version of the Ethernet-to-BITBUS gateway, board only. Custom assembly of header connectors or Sub-D/RJ45 (straight/right angle) per your requirements. 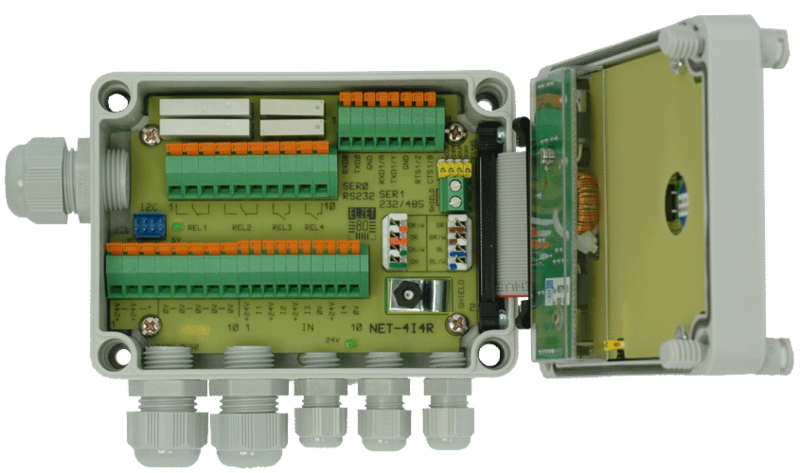 Comes with 24V supply but can be supplied by 3.3V alternatively. RS485 and CMOS level signals. RTS for use in repeater networks. 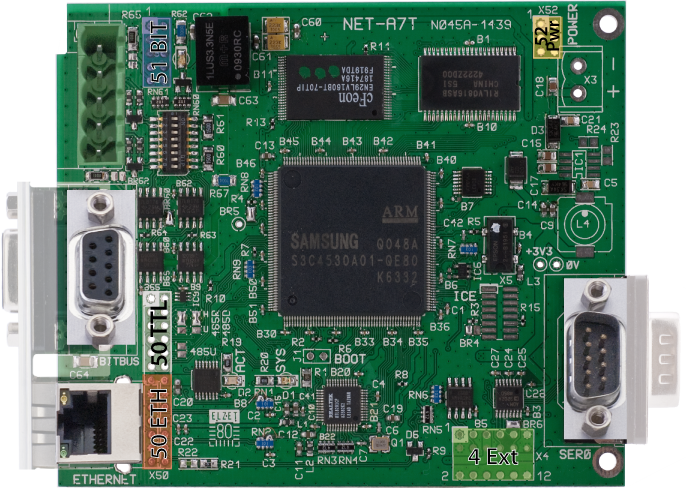 OEM version of the Ethernet-to-BITBUS gateway, board only. Needs 5V supply from 24VDC converter (NET-PS5 at 39€) or PoE supply (NET-PoE24/5 at 78€). 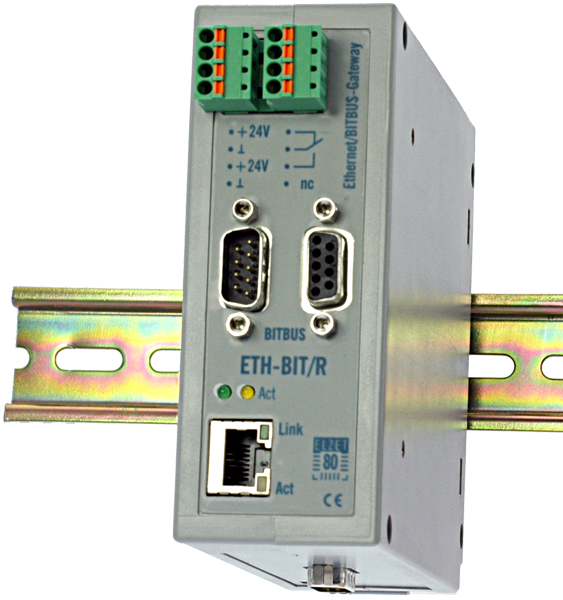 Ethernet/BITBUS-Gateway with 4 optoisolated 24V digital inputs and 4 relays (2 make, 2 c/o). Needs 24V local supply. To make the Ethernet transition transparent to the application software, there`s a BAPITCP.dll for Windows® that does the TCP wrapping and communication with the ETH-BIT's BAPI/TCP server - or, to be more precise, with up to 6 servers to fully simulate a local BAPInt.dll. If you rename this BAPITCP.dll to BAPInt.dll, your applications won't even notice the exchange of the transport layer and continue to work over Ethernet as they did through the built-in board. 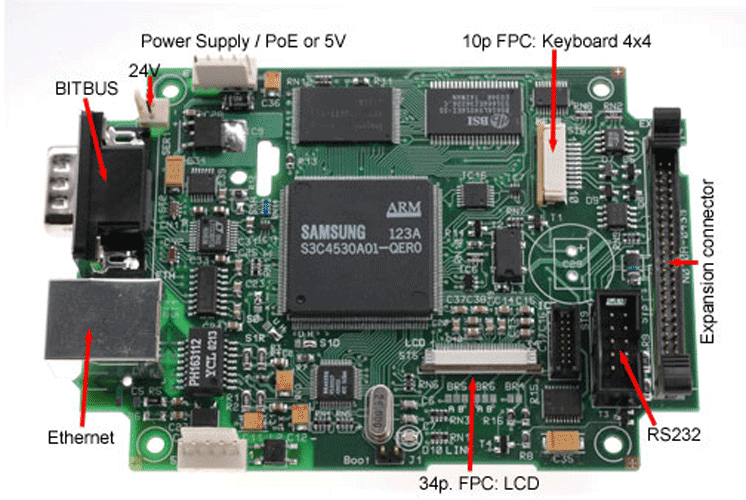 A tool (bapitcpcfg.exe) is provided to assign a specific server hardware IP to a logical board name like "BBUS0" as required by the BAPI protocol. You got Linux, QNX, iRMX or another operating system? Here's your chance to get on the BITBUS easily: As a stand-alone server ETH-BIT offers you BITBUS access using standard TCP/IP messages. Hence, if you are able to send TCP/IP socket messages from your operating system, you are able to do BITBUS. Please see the BEUG recommendation we implemented on ETH/BIT and our ELZET80 implementation notes. Under Windows, the BAPI/TCP server on ETH-BIT can be accessed directly via TCP/IP or through the BAPIxx.dll. Especially in a slave situation you might want to integrate BITBUS into your own hardware and access it via Ethernet. Two boards available for these applications: ETH-BITM and ETH-BITS. We suggest ETH-BITM as it allows more options of connector modification, has CMOS-level signals taken out and supports RTS transmit line control for repeater slaves. You still need ETH-BITS if you require the unit to be remote supplied by PoE (Power over Ethernet). ETH-BITM's encapsulated versions are ETH-BITE and ETH-BITF, which might give you an idea of the flexibility of connector arrangement. Click on the picture to see some detail of the overlayed connector options together with the naming of the header connectors. Signal details can be found under the installation tab of this page. The firmware is like with the other ETH-BIT variants and can be accessed conveniently through our Windows® drivers. From other operating systems, there's the option of direct TCP/IP access to the BAPI/TCP server task running on ETH-BIT (see BITBUS basics), the access specifications can be found below the "downloads" tab there. 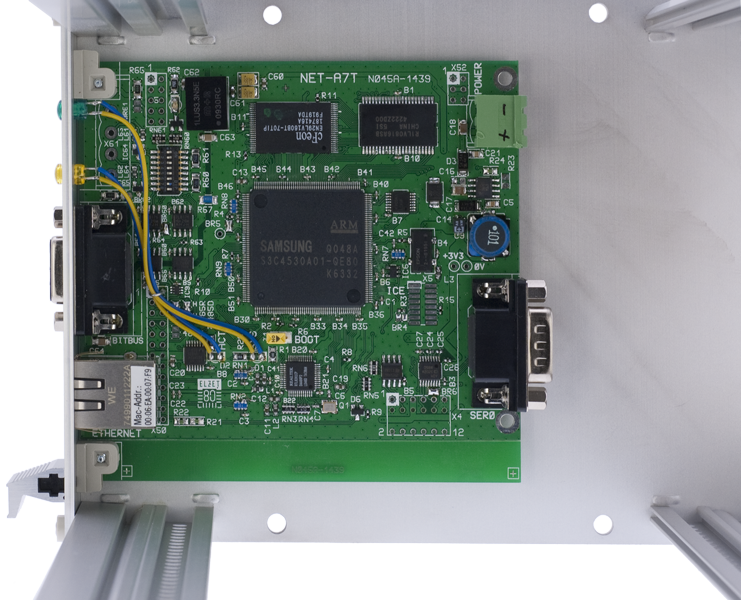 If you need to remote supply your OEM master or slave using PoE, you have to resort to the slightly less flexible ETH-BITS, which is the module version of ETH-BIT (without RTS repeater signal). Supply is from 5V, plug in the 24V standard supply or the PoE supply. Header connectors can be assembled (instead of the BITBUS and ETH standard connectors) from both sides), even for small quantity orders. Dimensions and header pin assignments for ETH-BITM OEM module.